Forget about Lake Wobegon. 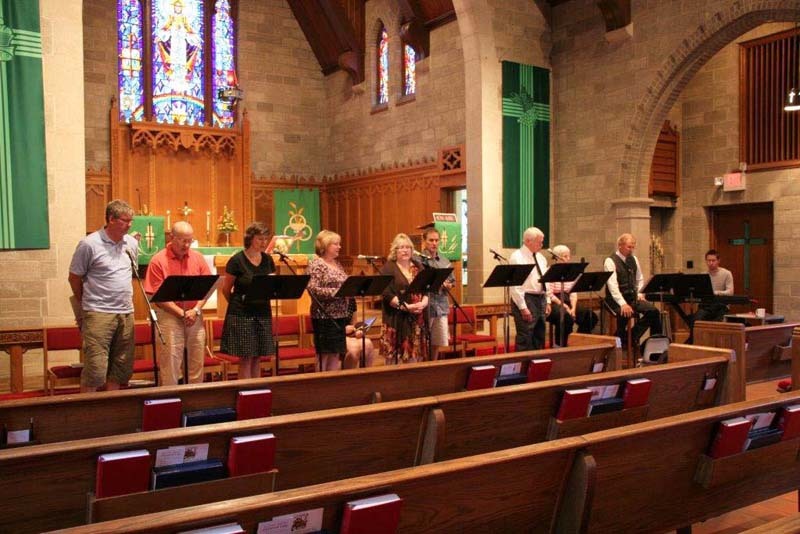 Lutherans in the Twin Cities have their own music and comedy radio program. And this one has actual Lutherans in it. 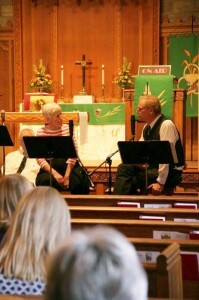 Members and friends of Diamond Lake Lutheran Church (ELCA) in south Minneapolis have been enjoying regular doses of the “New Frontier Lutheran Radio Hour” once a month for the past three years. The hour-long variety show, created in a broadcast format, can be heard by showing up in the fellowship room during the adult forum hour (9:30 a.m.) once a month on a Sunday morning. * an interview with a theologian from Luther Seminary (the serious part of the show). According to Diamond Lake Lutheran’s pastor, the Rev. Mark Orvick, the idea for the monthly radio show morphed out of a search for an alternative worship service for the congregation. A conversation with long-time church member Graydon Royce, a writing professional who works for Minneapolis’ Star Tribune newspaper, led to the Sunday morning variety program format. 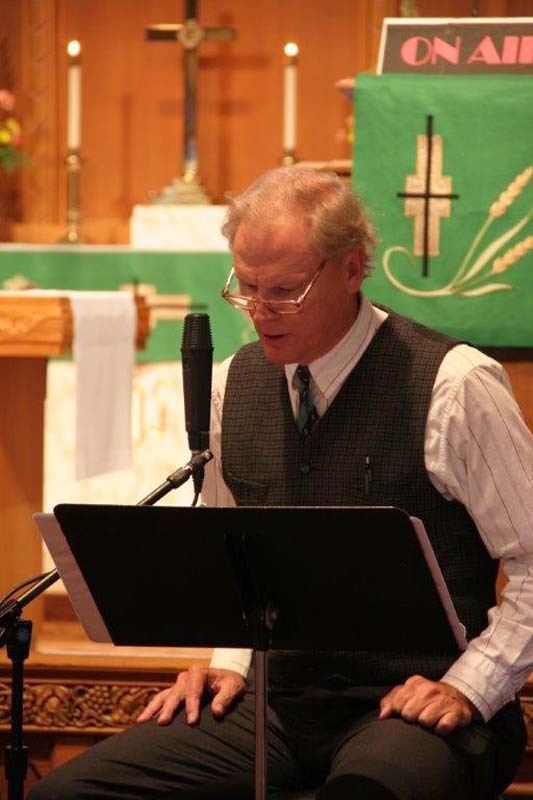 New Frontier Lutheran Radio Hour host Graydon Royce is “on air” in the sanctuary of Diamond Lake Lutheran Church in Minneapolis. The idea for the monthly radio show morphed out of a search for an alternative worship service for Diamond Lake Lutheran Church. Royce once wrote a column for the Lutheran Brotherhood (LB) Bond magazine titled “One Pew Over.” It featured members of fictional New Pioneer Lutheran Church. When LB merged with Aid Association for Lutherans and became Thrivent Financial, a new magazine emerged, but the column was not continued. When Orvick prodded Royce to create something for the congregation, New Frontier Lutheran was resurrected, this time as a Sunday morning radio program. Orvick, who has served Diamond Lake Lutheran for 11 years, says the thousand-member congregation is growing, but was not doing a good job of reaching the unchurched. “The mock radio program appeals to people who probably wouldn’t come to a regular worship service,” he says. The ideas for program segments, Royce says, come from daily life, suggestions from members and outsiders, and current events. “We have a group of four or five people who meet and kick around ideas,” he says. “In January we’ll have a skit about how singers are getting locked out of the choir loft by members of the worship committee.” Anybody who’s been paying attention to the travails of the Minnesota Orchestra over the past year will know where that idea came from. Garrison Keillor couldn’t have scripted a better story segment. Royce conducts an interview for the New Frontier Lutheran Radio Hour. Royce has written a half-dozen musicals that the youth of Diamond Lake Lutheran have staged each spring. Instead, he ended up in journalism, reviewing concerts and plays for the largest daily newspaper in Minnesota. His writing skills have been put to good use in the church over the years. He has written a half-dozen musicals that the youth of Diamond Lake Lutheran have staged each spring. Readers who are curious to hear what a “broadcast” sounds like, short of actually visiting Diamond Lake Lutheran on a Sunday morning, can visit the church’s website, http://www.DLLC.org, and click on the link for the broadcasts. All of them have been archived and are available for listening.